For Cuisine Noir Magazine. Oct 2018. If you don’t want to wait around to sync schedules with your parents, family or friends, you don’t have to. With technology at their fingertips and transparency among travelers, women are more empowered than ever to travel the world on their own. Moreover, the rewards are a more enriching experience where you have time to self-reflect, meet locals and explore on your own time and terms. 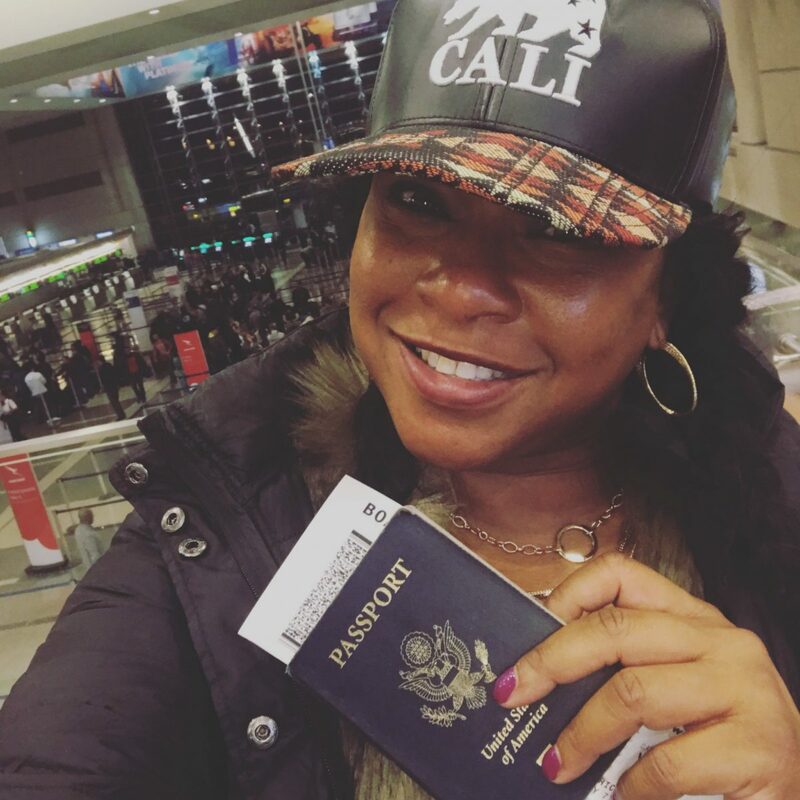 Tuanni Price started traveling abroad once her kids were grown up, wanting to find herself. She booked herself a three-week trip to Spain in 2013 and is now moving to South Africa for her wine tour company. “I loved the fact that I could wake up and roam around randomly, eat when I wanted to and explore the small towns,” she recounts her stay in Barcelona. Price says she prefers to stay at Airbnbs so she can save money and stay longer at a destination. She also uses Airbnb experiences to meet people and share meals. Over a dinner party experience in Barcelona, she met a few singles and they ended up celebrating a fun New Year’s Eve together. “You have to be careful about your location though,” she points out that she picks her accommodations in busy areas where there is always a security guard or doorman. The only time she felt unsafe was wandering through the streets of Paris late at night. “That is one place I would recommend staying in a nicer hotel or going with a companion,” she says referring to the mixed neighborhoods in bustling big cities. Price also uses Uber frequently and when she finds a good driver that she feels safe with, she hires them out for the day as it allows her the flexibility to visit several areas such as wineries around Cape Town at a negotiated rate. At 6-feet tall, social impact consultant Tammy Freeman often stands out in a crowd when traveling abroad. When she first visited Singapore in 2000 for a study abroad program, she had culture shock. “No one told me that I will be stared at all the time like I was on TV. For us in the U.S., that is considered rude, but in some cultures it’s acceptable,” she says. She realized that the people didn’t mean any harm, so she simply smiled or waved back. Freeman has been spending 2-3 months out of the year in Rio De Janeiro since 2016 running a social enterprise co-op. She also owns Soul and Story, an online store that offers amazing handmade goods created by women around the world. “Rio gets a bad rap for violence, like any major city, but you need to have your wits about you. It is not the place to wear your fancy shoes and gold jewelry. Just try to blend in, wear casual clothing like shorts, t-shirts, and flip flops so you don’t stand out,” she advises on traveling to Brazil. Kenya is another country that Freeman recommends visiting for its beaches, nightlife, food and markets. Instead of bars and nightclubs, Freeman prefers hotels, wine festivals, artisanal markets and malls, for they offer a more sophisticated and safe atmosphere for solo females. She also recommends visiting places that have good access to public transportation and are easy to navigate, such as Amsterdam, Istanbul, Cape Town and Amalfi Coast. Mia Herman is a flight attendant and travel blogger (Travel with Mia) who has lived all over the world and traveled to 30+ countries. Though married, Herman still travels independently to focus on her writing and to meet locals. “As a person of color, you need to research the political sentiment of the country,” she says and take extra care in countries that are politically unstable or where women are not given the highest regard. “Still I have never had a negative experience that has prevented me from traveling.” She notes that she received a lot of male attention in Istanbul, but it was harmless. Her safety tip is to never share your accommodation location with strangers even in a casual conversation with people you know because you don’t know who is listening in. Also, never announce specifics about where you will be and at what time publicly. Herman tries to find humor in every situation and not take offense to people of other cultures. 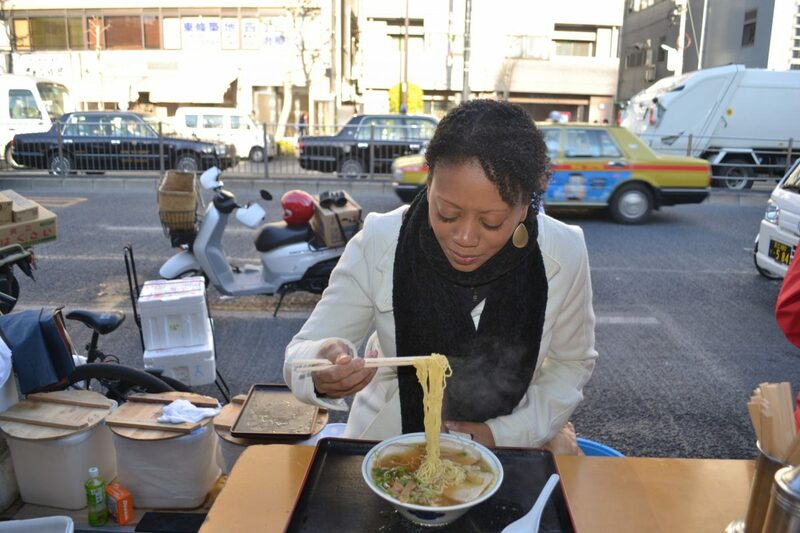 When dining at an authentic restaurant in Kowloon, Herman found herself to be the only black female surrounded by all Asians who started taking pictures of her eating her noodle soup with chopsticks. Without hesitation, she just posed for them. Herman’s favorite places as a solo traveler are the Czech Republic and Croatia as the “people are incredibly nice and welcoming” she affirms. For women who are traveling alone internationally for the first time, she advises starting with English speaking countries such as the UK, Ireland, Australia, New Zealand or going on a Mediterranean cruise so you don’t have to worry about the language barrier and can navigate more easily. On my first solo trip, friends had warned me of Morocco’s famous con artists. I was on alert during my train ride from Rabat to Fez when someone approached, offering a tour and car service. My inner voice advised me not to book a tour on a moving train but instead, visit their office and verify the company’s legitimacy first. Still, I booked it hiding my money in my socks, wrapped a whistle around my wrist and was always ready with plan B. Female instincts have come in handy more than once while traveling solo through 80 countries since then. Once, there was a sandstorm and I was stranded on the Israel-Jordan border. There was no other option but to take an overnight bus to Tel Aviv to make my flight back to Atlanta. The bus driver made all announcements in Hebrew as he or no one on the bus spoke any English. To make myself feel safer and not be left behind at restroom stops, I sat in the very front row and made sure the driver was aware of my presence. Every traveler must follow certain rules about carrying little cash, keeping backup batteries, learning a few words of the local language, etc. But when it comes to women, it is even more important to be aware of your surroundings, do your research and always have a plan of where you are going and make sure somebody back home knows about it at all time. ~ Written for Cuisine Noir Magazine. For One Travel’s Going Places. September 2018. With holidays around the corner, chances are you will encounter larger crowds and weather-related delays while traveling. It’s a frustrating fact about air travel and being equipped with the right tools and knowledge can seriously save you some stress and aggregations in case you end up getting stuck in an airport. For One Travel. May 2018. Whether you are a thrill-seeking mountain climber, long-distance biker, or just like to relax outdoors with the family, chances are that you will be able to find an amazing vacation that will satisfy your mind and body in the expansive 1,200 miles of Yosemite National Park. While the best time to visit Yosemite is during spring when the snow is melting and the waterfalls are at their full gushing glory, its massive granite mountains covered with glaciers, ancient giant sequoias, and vast meadows are spectacular year-round. Continue reading on One Travel…. For Khabar Magazine print edition. February 2018. Warm humid air, the smell of roasting curry leaves, voices sounding singsong Malayalam, coconut trees as far as I can see—I had arrived in Kerala, also known as God’s Own Country. As soon as I landed at Kochi International Airport, I felt like I was no longer in the India I was so familiar with. Being raised in the north (Punjab), I could instantly see a drastic contrast in the environment and attitudes of the people. The two-lane highways in Cochin were lined with colorful shops selling everything from masala tea and banana chips, to 24K gold jewelry. But as thousands of vehicles drove past during rush hour, each gave way to the other in an orderly fashion with barely audible honking, a background sound I had been accustomed to until a few hours ago. In Kerala, traffic, people, nature—all hummed a similar tone of peace and harmony. Kerala has been named India’s most advanced state (if not in the top two) in many respects. It is the safest, healthiest, most environment-friendly state with some of the best educational and agricultural prospects in the country. With high literacy (over 94%), equal opportunities for women, and very little poverty, Kerala has become the epitome of success for India’s development. It is no wonder that tourists from all over India and abroad who are seeking a calm and ecofriendly retreat head to Kerala. My first stop in Kerala is Marari Beach, a 2-hour drive from Kochi, where I am greeted at my hotel by smiling staff members dressed in perfectly pleated saris and starched white mundus (a garment wrapped at the waist like a lungi). They offer me cold tender coconut water picked from their own front yard and usher me into a thatched-roof bungalow with a spacious bathroom that has a semi-open roof shower. I feel that I am at a luxurious fishing village, surrounded by nature, but equipped with modern amenities. Set on 30 acres of beachfront covered with coconut groves, lily ponds, fruit trees, and a large organic farm, I feel instantly relaxed at Marari Beach Resort in Mararikulam. Many people come here for week-long wellness retreats indulging in daily yoga lessons, Ayurveda massages, and customized vegan meals to heal their bodies. (Left) A mouthwatering destination for foodies. Seafood Thali. While listening to melodious tabla and flute played by live performers, I feast on my first Kerala meal of fresh grilled seafood, fragrant meat stews, appam (fermented rice pancakes), and a dozen homemade pickles from vegetables picked at the resort’s organic gardens. 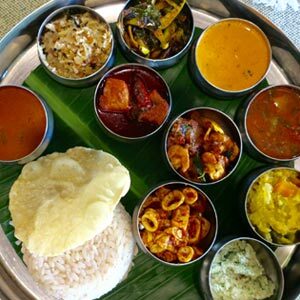 Abundant with spices, the cuisine of Kerala includes a wide assortment of vegetarian and non-vegetarian dishes flavored with chilies, mustard seeds, coconut oil, curry leaves, and ghee. Most ingredients are grown locally, if not in people’s own backyard gardens. Even the spices and oils are harvested from neighboring villages, ensuring quality and freshness. The “50 Mile Diet” is a reality here as most meals are cooked with ingredients sourced within 50 miles of the resorts. The next day, I wake up at the crack of dawn to stroll on a secluded beach, gazing at the power waves of the Arabian Sea, and to practice a few of my asanas with the very flexible resident yogi. Yoga is an essential part of the mind-body restoration and practically all resorts offer free yoga lessons. After a breakfast of freshly made dosas, it is time to explore the neighboring town of Alleppey, popularly known as “Venice of the East” due to its intricate network of canals. (Right) A Hindu temple in Alleppey. Alleppey—or Alapuzha as it has been renamed—is a great place to see the harmonious religious diversity of Kerala. It is believed that Christianity came to Kerala in the first century. Kerala is now home to the largest population of Christians in India. At Christ the King Church, I see statues of Jesus decorated with money garlands just like you would at a Hindu temple. Just next door, one can hear the Muslim call to prayer. 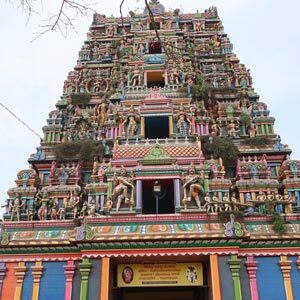 There are a few Hindu and Jain temples around Alleppey that are also worth visiting. Colorful painted wood, stone, and metals are used to create multiple-storeyed pyramid style structures and compound walls. I walk through the grand entrance (rajagopuram) and go in barefoot to pay my respects to the Gods at the majestic Kidangamparambu Sree Bhuvaneswari Temple. There is a feast, festival, or celebration taking place throughout the year, with processions and offerings at the temples and churches. Common to all religious communities is the harvest festival of Onam, which takes place for 10 days sometime in August-September. (Left) Usually there is a clash between commerce and natural beauty, since development cuts into the latter. The lush green landscapes of tea plantations, however, translate to great commerce as well. 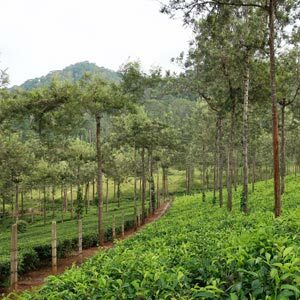 I continue my journey, heading inland on a winding road through lush green cardamom hills and terraced tea plantations to the hill station of Thekkady. Many of the tea factories in the area offer tours and tastings, so I stop to pick up packets of green and black teas at wholesale prices. The small town of Thekkady is densely packed with spice shops selling freshly dried cinnamon, nutmeg, cardamom, black pepper, vanilla, and nuts. Nearby, there is a cardamom (elaichi) sorting factory and the largest cardamom auction house in the world. The aromatic seeds were first commercialized by the British who developed plantations, and India is now the biggest producer of cardamom in the world. It is hard not to stock up for the year on high quality spices sold at a fraction of store prices! (Right) Spice Village, the author’s lodging in Thekkady. My lodging in Thekkady is aptly named, Spice Village, and is the oldest mountain village-style resort in the area. Surrounded by hills and backed by forest, the cottages are spaced around spice trees. A naturalist takes me around the property to introduce me to the variety of flora, and the monkeys and birds that hang around the cottages. 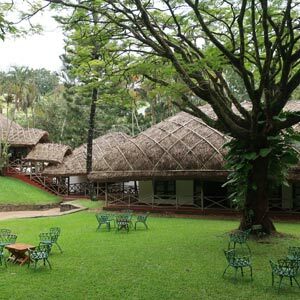 Keeping true to Kerala’s eco-friendly nature, the resort grows its own food, filters and bottles its own water, composts food waste, harnesses solar energy, and even makes its own paper. Local culture is also intricately tied into the visitor experience. In the evening, guests gather in the community hall to watch live performances of Bharatanatyam and Mohiniyattam before retiring to Woodhouse Bar for a nightcap. The former home of forest ranger Mr. A. W. Woods is converted into a British-style pub with old black and white photos, antiques, and a 150-year-old billiards table. 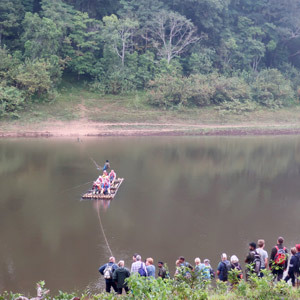 (Left) Crossing the river by old-fashioned rafts, to get to the Periyar Tiger Reserve. We watch an exciting slideshow at the Interpretation Center – Tiger Club located at Spice Village, thrilled at the prospect of encountering tigers and elephants in the wild. Dressed in camouflage, leech-proof socks, and walking boots, I make my way to Periyar Tiger Reserve on a bus, then cross the river on an old-fashioned bamboo raft, and finally set foot into the forest. After a few hours of trekking through the serene sanctuary set in the mountainous Western Ghats, my ranger and I only see some wild dogs, giant squirrels, deer, langur, macaque, and mongoose. “Chances of seeing a tiger are very rare!” he informs me, though evidence of sighting exists in pictures back at the Tiger Club. One cannot come to Kerala and not experience the backwaters, one of the most popular tourist destinations in India. Kerala backwaters are made up of five lakes and 38 rivers, linked by canals. The backwaters are an important part of Kerala’s infrastructure as they provide water for irrigation, access for transporting rice, and environment for aquatic life. Kumarakom, located on the banks of the Vembanad Lake is my next stop. Many people come here to rent a houseboat or ketuvallam and cruise on the waters for a night, enjoying the cool breeze and eating fresh catch. Watching the architecture and design of the traditional Kerala houseboats is charming as you see these floating homes (equipped with beds and restrooms) make their way through coconut groves, water hyacinth ponds, and rice paddies. I decide to stay at Coconut Lagoon, a heritage hotel located by India’s longest lake. Accessible only by boat, a water taxi brings me to the reception of the hotel, which is intertwined by lagoons and bridges. Each of the buildings is made of wood salvaged from historic homes from all over Kerala and reassembled on the property. The inside of the room looks like an intricately carved wooden houseboat. With spectacular views of the lake, rice paddies, gardens, and a bird sanctuary, it is hard not to feel completely relaxed. (Right) Kerala is a popular destination for Ayurvedic massages, and detox and rejuvenation retreats. 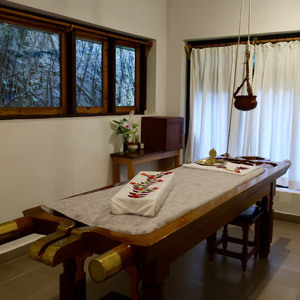 If the scenery and organic food is not enough to comfort the senses, two Ayurvedic doctors (known as vaids) are available at the spa to diagnose and treat common ailments. Ayurveda is one of the oldest medicinal practices in the world and widely followed in Kerala. It is believed that the wet temperate climate, abundance of medicinal plants, and an abundance of Ayurveda colleges and researchers make Kerala an ideal place to consistently experience the benefits of Ayurveda. After a brief conversation with my doctor and diagnosis of my vata, pitta, and kapha, I am advised to get a four hands massage to help with my stiff neck and shoulder aches. Using a mixture of essential oils and extracts, two ladies gently rub the liquid in circular motion to release tension and relax my muscles. To end the day, a local lady known simply as “Amma” pulls in her canoe to serve chai and snacks to the guests staying at the resort. She skillfully ribbons her homemade masala tea from one steel cup to another offering a magical show of sorts that entertains kids and adults. We sit on the green lawn, sipping on hot tea and gaze out at the calm waters. Being in Kerala for a week has slowed me down and infused the sense of tranquility that every vacationer seeks. ~ Written for Khabar Magazine. February 2018. For Cuisine Noir Magazine. January 2018. I arrived in Dar es Salaam with Grace Odogbili, a Nigerian-American chef and caterer from Brooklyn. 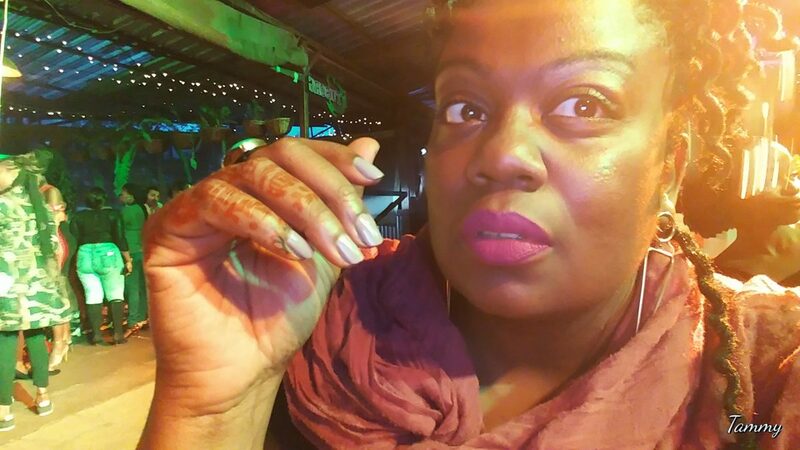 Having worked with New York’s top restaurants and caterers, Odogbili started her own business, Dining With Grace, in 2010 to offer people a chance to savor regional cuisines of the African diaspora. She teaches nutritional culinary arts workshops in Brooklyn’s public schools, introducing underserved communities to healthier lifestyles. This was the first trip to East Africa for both of us. For the next several days, we explored the cuisine and culture of Tanzania, like a local, with a local. “When I started The African Table, a monthly pop-up dining series in 2013, I hosted “A Night in Zanzibar” dinner at a Brooklyn art gallery where we had a multi-course Tanzanian inspired meal with live music. That’s where I met Justa Lujwangana, who had recently started a Meetup group namedCurious on Tanzania (COT). She was my featured guest and since that day we decided we must go to Tanzania together, ” says Odogbili. Lujwangana is a Tanzania-born African who has lived in Uganda and New York. She also founded COT as an experiential travel company. We headed to Lujwangana’s house in the quiet suburbs of Dar which she calls “the COT house.” The two-story bungalow, with its five bedrooms, beautiful garden and spacious living room and kitchen, is a private guest house listed on Airbnb. Dressed in a brightly colored cotton dress called a kanga, Luiwangana welcomes us to the place she calls home for a few months each year. “Karibuni Tena!” (meaning welcome to Tanzania) she exclaims with a big smile. This is a greeting we got accustomed to hearing many times during our visit. Over a breakfast of smoked eggplant and tomato stew, steamed cassava, chapatti and ginger tea, she tells me how she started COT. “I wanted to give people the opportunity to hear the untold stories of Tanzania and go beyond the safaris,” she explains about bringing groups from New York to Tanzania on dance, music, sporting and culinary tours. Together we explored the cosmopolitan big city. During the day, busy streets clog traffic as street peddlers walk up to cars selling everything from chopping boards and wood carvings to fidget spinners. At night, restaurants and bars are alive with women dressed in long flowing Western dresses and men in sharp Western wear sipping on cocktails, enjoying the summer breeze. We frequent several upbeat neighborhoods, watch live music and enjoy late night dinners. The next day we board a ferry to the island of Zanzibar, Lujwangana’s “second home.” Everyone seems to come greet her as we walk through the narrow cobblestone streets of Stone Town. We stay at the Mizinghani Seafront Hotel, a historical building that was originally built for newly married royal couples for their honeymoons.Ornate wood doors, wool tapestry and mosaic floors speak to the hundreds of years of Portuguese and Omani influences left on the island. The island is also home to a small Arab and Indian population. Our main reason for being here now is the Stone Town Food Festival. A celebration of local flavors featuring over 30 restaurants offering special prix fixe menus, it culminates at a two-day street fair at the island’s gathering spot, Forodhani Gardens. We pay anywhere from $1 to $5 for a tasting and feast on fried sardines, fish balls, beet salad, hummus, pita and more. Odogbili and I are intrigued by “Zanzibar Pizza” signs that several food vendors display. Minced meat, bell peppers, eggs and cheese are stuffed into a crepe thin like pocket and fried with ghee. Served with hot sauce and mayo, it is not a traditional pizza but a popular local street food no less. In the morning we head to the island’s oldest vegetable market for produce and then to the home of a Swahili family for a cooking class. All of the female extended relatives and neighbors gather to greet us and give us a change of traditional clothes for wearing at home, which is custom. Odogbili instantly takes charge of the outdoor kitchen while all the women chop, shred, and fry food over a charcoal stove. “Cooking with the Swahili women felt like being home with your tribe of sisters. Everyone must play their part so we can all eat together. It felt like nothing was rushed, it was life and it was sweeter when done in community,” she recalls. After several hours of cooking, we sat on the floor eating with our hands and sharing laughs and stories. The turquoise blue waters of the Arabian Sea are dotted with dhows, traditional wooden sailing vessels operated by skillful sailors. On one of the days, Lujwangana organized a special sail to one of the most beautiful sand banks off Stone Town and a picnic on the beach. Surrounded by white sand and crystal-clear water, we feast on grilled lobster, prawns, calamari, fish, accompanied by kachumbari salad, French fries and steamed rice. We take turns swimming and snorkeling. No visit to Zanzibar is complete without a visit to a spice farm. At Jumbo Spice Farm, we get to understand why Zanzibar is named the island of spices. Cardamom, cloves, black pepper, cinnamon, nutmeg – practically all of the spices I had ever heard of can be found here. We also got a chance to make our own masala chai blend and received beautiful handcrafted floral gifts and had a delicious farm-fresh lunch. “I’ve used the masala chai spice blend for everything from curries, desserts, dry rubs and more. I make an amazing carrot cake with masala chai cream cheese frosting. It’s delicious,” Odogbili says tempting me a few weeks after our trip. We end our tour with a safari at Selous Game Reserve, one of the largest animal reserves in the world, where we stay at a tented camp overlooking a river and spot zebras, giraffes, buffalo, impala and a lion. Here, we had a chance to interact with Maasai tribes and bushmen, learning about their traditional dances. “Tanzania is truly a beautiful country with so much rich history,” says Odogbili and I agree. It offers everything from beautiful beaches, quaint hotels and indigenous art, to diversity of flavors from Arabic, Portuguese, African and Indian traditions. With warm hospitable people who are always smiling and dancing, it is impossible not to fall in love with Tanzania. Enjoy these recipes for Masala Coconut Caramel Spread, Boiled Cassava w/ Kachumbari and Spicy Beet & Coconut Salad courtesy of Grace Odogbili. For more information about Dining With Grace, visit www.diningwithgrace.com and for Curious on Tanzania, visit www.curiousontanzania.com. Written for Cuisine Noir Magazine. January 2018. For CheapOAir Miles Away Blog. November 2017. Ready to explore the enormous continent of Africa but don’t know where to start? There are 54 countries in Africa, offering amazing opportunities to immerse in the culture, as well as view nature and wildlife. Most travelers flock to South Africa, not realizing it is farther, more expensive, and already packed with tourists. For Cuisine Noir magazine. October 2017. Eight ways to travel safer, cheaper and make a difference. Wish you could travel more? Perhaps a limited budget and time is holding you back. Or maybe you are waiting for a friend or spouse to accompany you on your journey. Travel is an important part of our lives, an experience that opens our minds, makes us more confident and helps us be creative. But it doesn’t have to be something only the rich or retired can afford. Here are a few ways you can travel more frequently, for longer periods of time, without breaking the bank. You can even use some of these tips to even travel for free. Home Exchanges – Remember the 2006 movie, “The Holiday,” with Cameron Diaz who lived in Los Angeles and Kate Winslet in London, swap homes at Christmas after bad breakups with their boyfriends? If you have a house, condo or even a rented apartment, you can swap with another traveler from a different part of the world. It’s a great way to save money on hotels and you get to experience what it is like to live in that country. Just register on home exchange websites such as HomeExchange.com and iLoveHomeSwap.com, indicate where and when you want to travel, and send a request to exchange a home. House Rentals – If you are not comfortable with swapping your place to complete strangers, you can still rent a home or a room on your next vacation. Websites such as Airbnb.com, HomeAway.com, and VRBO.com allow you to rent directly from homeowners by the night, week or month, cutting out the middle man. Hosts will often share the best local spots in the city to eat, visit and party, as well as which areas to avoid. Also, having access to a kitchen means you can save money on eating out. During a solo trip to Italy last summer, I stayed with a couple in Naples through Airbnb. They mapped out my daily explorations so I would avoid the not so safe areas of town and be able to take a more scenic route. They even guided me to the best pizza places in town that the tourists didn’t know about. Volunteer Travel – Many for-profit and nonprofit organizations organize one-week to a few months long volunteer tours that include lodging, meals and sightseeing for a small price. Volunteers Initiative Nepal charges roughly $10 per day to place with a host family in exchange for helping in the villages with construction work, teaching or health care. Vaughan Town covers your hotel stay and 3-course meals in charming resorts across Spain and Germany if you teach conversational English. By engaging in volunteer work you get to meet locals and other travelers, so you will never feel lonely. I have volunteered abroad in a dozen countries through Go Eat Give and other organizations. What I the enjoy most is the ability to meet people from all realms of society and understand their issues on a deeper level. As tourists, we don’t get a chance to see beyond the pleasurable side of the destination. Farm Stay – Many families are turning toward farm stays to have productive bonding time, teach the kids important values, be close to nature, and experience country living. Help harvest grapes, press olives, make wine, rear pigs, milk cows or make cheese in exchange for free food and accommodations in Italy, Canada, Australia, France and more paces. On WWOOF.net, you can find opportunities to work on organic farms in 120 countries. Barter for Work– If farming is not your thing, but you still want to exchange your skills for room and board and have a culturally immersive experience, register at Workaway.info or HelpX.net. Some of the projects listed on the sites include developing a community center in Italy, running a hostel in Brazil, and dog-sitting in South Africa. By working abroad, you get to understand the local culture, practice the language and make new friends. House Sit – This involves the least amount of work and gives you access to some of the most luxurious homes around the world, for free! All you have to do is keep the house safe and clean, water the plants, take care of the pets (if any), and enjoy the facilities. Look at HouseCarers.com, MindMyHouse.comand Trustedhousesitters.com for where you can go. Work on a Yacht – Can’t afford a yacht but love to sail? At the sites FindACrew.net, CrewSeekers.net and DesperateSailors.com, you can find yacht delivery jobs around the Atlantic, Caribbean, Mediterranean and more, as well as captains looking for extra nautical help onboard. Working Holiday Visa – If you are between 18-30 years old, you can get a working holiday visa in countries like Australia, New Zealand, Canada, France, Ireland and Singapore. This allows you to work and stay for up to a year without having to apply for work permits or sponsorships. Working part time at a bar, restaurant or theme park means extra cash in the pocket to make your vacation last longer. ~ Written for Cuisine Noir magazine. October 2017 digital issue.